An alternative way to control your Fire TV is the official Remote App from Amazon. This article explains how to setup the App (available for iOS, Android and Amazon Hardware) and what features it has (with some bonus for Fire TV Stick users). Surely one of the best ways to control your Fire TV. Nice for Fire TV Stick users: You can use the voice search with the App and save the 30$ for an additional Remote with Voice capabilities (because the Remote with Voice Search isn’t included when you buy an Amazon Fire TV Stick). If you like Keyboard input better than Voice Search or the virtual Keyboard on the Fire TV, all users can benefit from the Phone Keyboard (button in the upper right corner of the App). The Voice Button button only works for customers in the USA, UK, Germany, Austria, Japan and India. It’s very easy to use the Fire TV Remote App because it’s similar to the normal hardware Remote. Some people even say that this is the best way to control your Fire TV. The navigation buttons from the Remote (up / down / left / right) aren’t clicks but swipes on the pad of the Remote App (see pictures). Your TV displays a code. Enter this code on your Phone. Done. You can see all of the remote apps that are paired with your Amazon Fire TV device under “Settings > Controllers and Bluetooth Devices > Fire TV Remotes”. Do games work with the Remote App? Of course, you can try to play games. But Amazon says: “The Fire TV Remote App is not designed to play games. Some games might work, but performance will vary. The app does not currently support Second Screen or Display Mirroring.” So if you really want to play games you should better use the regular Remote or the Gamepad (there are also Gamepad available for Fire TV). The Remote App isn’t the best for gamers. And the best is: You can try this for free – just install the App. If you don’t like it, you haven’t spend any money. And this kind of Remote doesn’t need any batteries. I had the firestick app on my phone at home but my firestick was turning itself on at all hours so I got rid of the app and used my regular stick remote. I remembered the app the app was in iCloud so I downloaded it and I cant pair with the same stick on a different tv so I brought the stick for nothing ! I have the wifi password too. In short, you can’t. I’ve read somewhere a way to do it, but unless you are a hacker or coder, forget it. It will work on their TV with their remote! Connect it to your WiFi then you can possibly transfer it to another tv and use an app on your phone. How do i use the mouse on the phone? 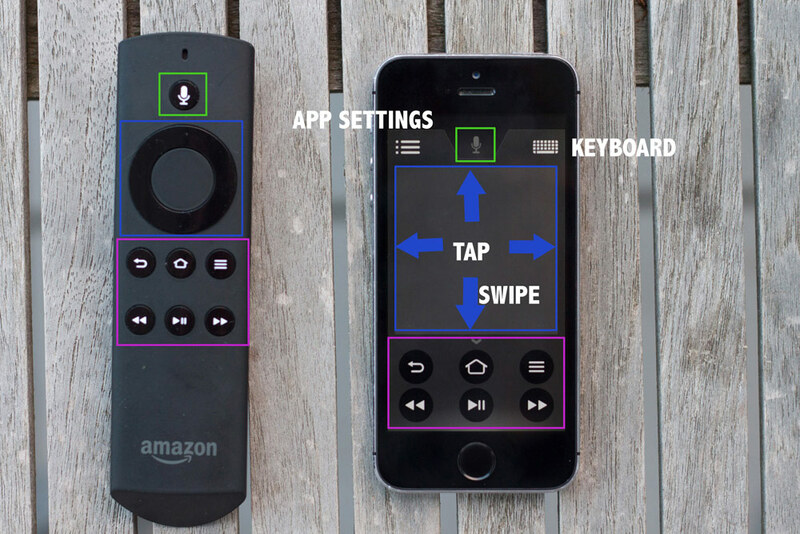 How did you set up the Fire TV Stick to the Peel Smart Remote? Did you get an answer yet? I want the firestick to be controlled by peel also. Like what did you select (streaming media player or HDMI Switch) and if one of those options, what’s the brand or model you selected and how did you get them to sync? make sure you have your phone set to ‘wifi’ and connected to the same network the fire stick is connected to. That was my problem. how do you check networks ? What do you mean “connected to the same wifi network” I cannot change the fire-stick network which was set up on another TV as it was set to that TV to which I no longer have access. It worked well on the other TV. Hi i have a matrix spliter. i have put my firestick into it but it does not let me change channels. I know the remote has bluetooth capabilities but does it also have any infrared settings? If so do you know where the infrared window is on the firestick? I used the app to make my phone the remote but now I’m leaving the house so How do I make the TV remote work again so my family can control the TV without my phone? I love your posts, thanks. Separate question: do you know if you can use speakers on an AirPort Extreme as the output source for audio from a fire stick? Hoping to use wifi speakers rather than Bluetooth. Cheers! I’ve just factory reset my fire stick, but now it’s asking me to pair my remote with the stick to get it set up again, however I only have the app. Because it’s factory reset, its now forgotten the WiFi and my app, so how do I pair it? As with the last 2 questions, same. How do I pair the remote app to the fire stick when I need to press the home key to start the fire stick set up BUT can’t get a home key without already having the fire stick set up to have access on the remote app. i can not pair samsung android pho to fire tv can anybody help mi? all you have to do is to restart the phone. How can I listen to my fire stick using ear buds on my iPhone? Roku app allows me to listen from my phone. Thanks! I lost my Fire TV remote. Trying to use my I phone6 as remote for my fire stick don’t know the “code” that was mentioned not sure how to get firestick app on my phone (DONT KNOW ALOT ABOUT THIS),also have ROKU BOX IS IT BETTER THAN FIRE STICK? How do I get remote to connect if I had to restart stick? I put a VPN on my Firestick and now I can’t control it with the phone app bcuz they have to be connected on the same network. My dog chewed up my remote. I don’t have my tv remote either. HELP! Do I unplug my fire stick before leaving the house? There isn’t a off button. Does it hurt to leave it plugged in? I downloaded the firetv remote app, it paired to the fire stick no problem. A few days later when I tried to use it, it wouldn’t connect. Why? How can I fix it?